Southeast Alaska is a narrow strip of coastline and offshore islands next to the province of British Columbia, sometimes referred to as the Alaska Panhandle. The Inside Passage of the Alaska Panhandle is a coastal route for oceangoing vessels along a series of passages between the mainland and the coastal islands. The name Inside Passage is also used to refer to the ocean and islands around the passage. Most areas of Southeast Alaska below 500 meters elevation are heavily forested with conifers. With 100-300 inches of rain per year, the region is a temperate rainforest. The scenery of this coastal paradise is truly spectacular, but living for months without seeing the sun can lead to depression! Most of the land area of Southeast Alaska is encompassed by Tongass National Forest, Misty Fjiords National Monument, and Glacier Bay National Park. Fishing is a major industry in Southeast Alaska, and it is done at all scales. Ports are full with small vessels for commercial, charter, and private fishing. The other large industry in Southeast Alaska besides tourism and fishing is logging. Use of the rich timber of the Northwest Coast has a long history. Sitka spruce and western red cedar are two of the most abundant trees. Both have great economic value. The Tlingit culture was so tied to the cedar they spread northward along the coast in unison. The Tlingit and Haida natives are famous for their totems, and they also built (and still build) homes and other buildings from the cedar. Parts of this tree are used for many other purposes as well. Southeast Alaska was not always the rainforest that it is today. Evidence of erosion and deposition by glaciers can be seen almost everywhere. Glaciers still dominate many of the higher mountains of Alaska. 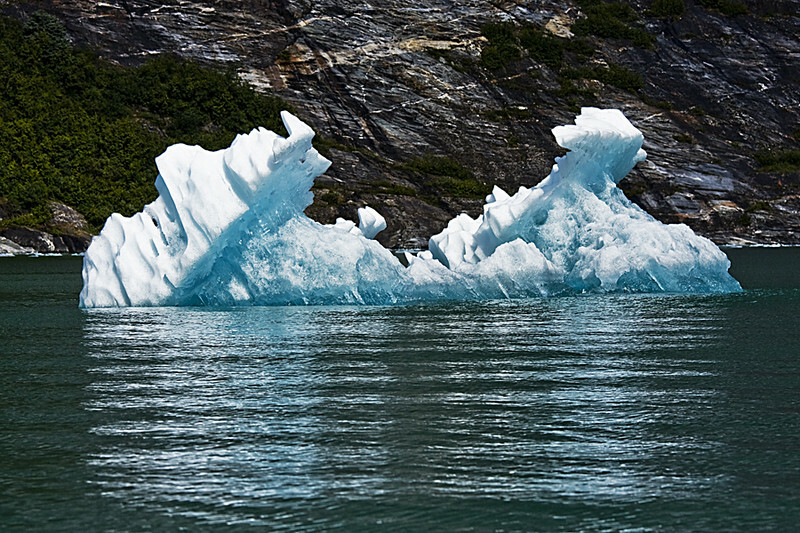 Several glaciers even reach tidewater and produce small icebergs. The Inside Passage is teaming with wildlife. The most common are humpback whales, particularly in summer when they come in groups for feeding. Orca pods are also seen on occasions. Many types of sea birds spend the summer in these fertile waters. Another common group of marine mammals is the pinnipeds, who feed in the water but like to lounge on rocks where they are safe from orcas. Southeast Alaska has a rich geologic and cultural history and an abundance of magnificent scenery and wildlife. It is a wonderful place to visit.